I had spent a few days getting up-to-speed on Node and the environment (I’ve been working in client technologies for a long while remember) and using VS Code, which was fun. But using C# would have been more efficient for me (or so I thought). AWS Lambda services just announced they will support C# as the authoring environment for a Lambda service. As it turns out, the C# Lambda support is pretty general so there is not compatibility in the dev experience for creating a C# Lambda backing a skill as there presently is for Node.JS development…at least right now. I thought it would be fun to try and was eventually successful, so hopefully this post finds others trying as well. Here’s what I’ve learned in the < 4 hours (I time-boxed myself for this exercise) spent trying to get it to work. If there is something obvious I missed to make this simpler, please comment! This project name doesn’t need to map to your service/function names but it is one of the parameters you will set for the Lambda configuration, so while it doesn’t entirely matter, maybe naming it something that makes sense would help. We’re just going to demonstrate a dumb Alexa skill for addition so I’m calling it NumberFunctions. 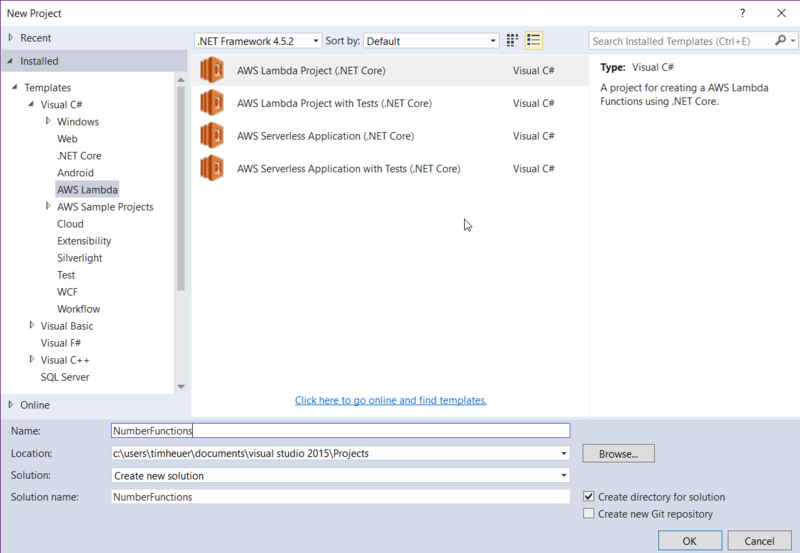 NOTE: This post isn’t covering the concepts of an Alexa skill, merely the ability to use C# to create your logic for the skill if you choose to use AWS Lambda services. You can, of course, use your own web server, web service, or whatever hosted on whatever server you’d like and an Alexa skill can use that as well. Once we have that created you may see the VS project complain a bit. Right click on the project and choose to restore NuGet packages and that should clear it up. The next step is to write the function handler for your skill. The namespace and public function name matter as these are also inputs to the configuration so be smart about them. For me, I’m just using the default namespace, class and function name that the template provided. The next step is to gather the input from the Alexa skill request. 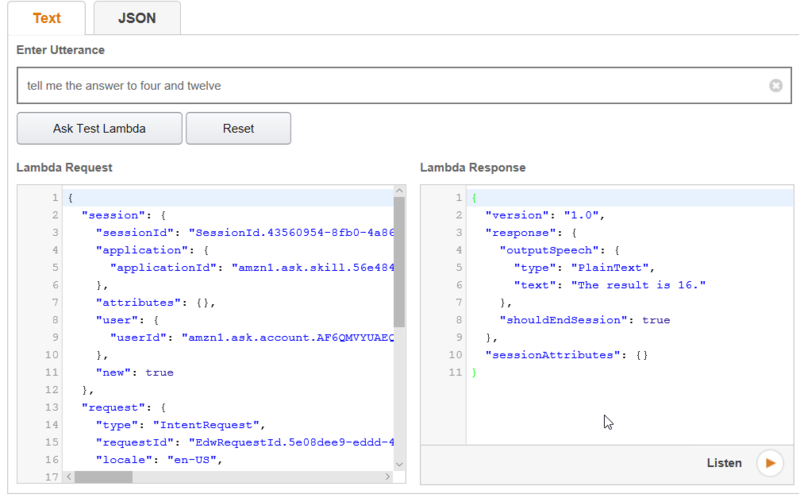 Now a Lambda service can be a function for anything…it is NOT limited to serve Alexa responses, it can do a lot more. But this is focused on Alexa skills so that is why I’m referring to this specific input. Alexa requests will come in the form of a JSON payload with a specific format. Right now if you accept the default signature of the function handler of string, ILambdaContext it will likely fail due to issues you can read about here on GitHub. So the best way is to really understand that the request will come in with three main JSON properties: request, version, and session. Having an object with those properties exposed will help…especially if you have an object that understands how to automatically map the JSON payload to a C# object…after all that’s one of the main benefits of using C# is more strongly-typed development you may be used to. Rather than create my own, I went on the hunt for some options. There doesn’t exist yet an Alexa Skills SDK for .NET yet (perhaps that is coming) but there are two options I found. The first seemed a bit more setup/understanding and I haven’t dug deep into it yet, but might be viable. For me, I just wanted to basically deserialize/serialize the payload into known Alexa types. For this I found an Open Source project called Slight.Alexa. 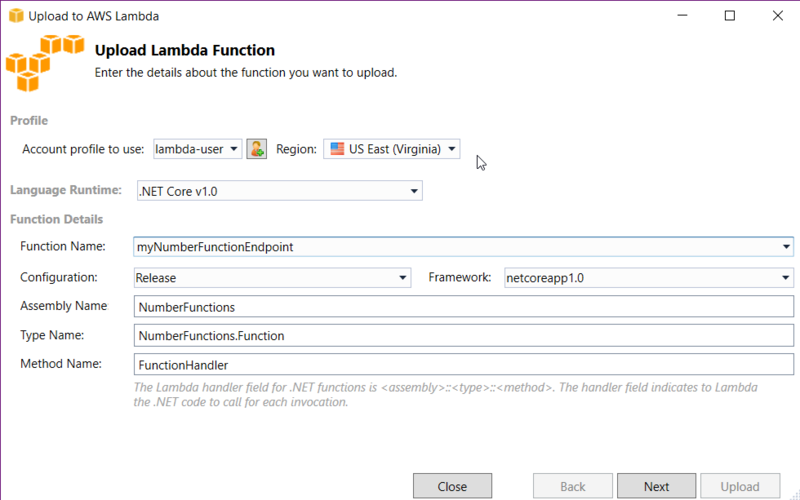 This was build for the full .NET Framework and won’t work with the Lambda service until it was ported to .NET Core, so I forked it and moved code to shared and created a .NET Core version of the library. 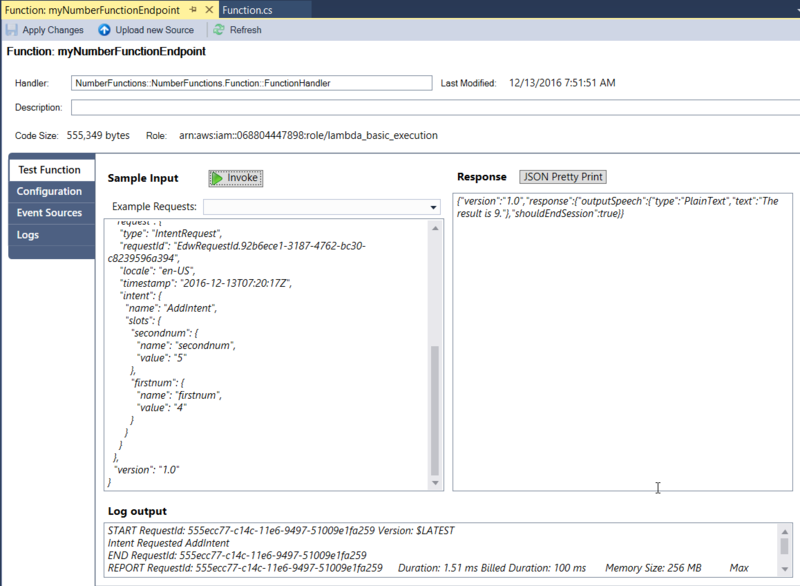 NOTE: The port of the library was fairly straight forward sans for a few project.json things (which will be going away) as well as finding some replacements for things that aren’t in .NET Core like System.ComponentModel.DataAnnotations. Luckily there were replacements that made this simple. Because SkillRequest is an annotated type the library knows how to map the JSON payload to the object model from the library. We can now work in C# against the object model rather than worry about any JSON path parsing. I’ve now completed my function, let’s upload it to AWS! You’ll want to make sure you choose a region that has the Alexa Skill trigger enabled. I don’t know how they determine this but the US-Oregon one does NOT have that enabled, so I’ve been using US-Virginia and that enables me just fine. The next screen will ask you to specify the user role (I am using the basic execution role). If you don’t know what these are, re-review the Alexa skills SDK documentation with Lambda to get started there. These are basically IAM roles in AWS that you have to choose. After that you click Upload and done. The toolkit takes care of bundling all your stuff up into a zip, creating the function (if you didn’t already have one – as if you did you can choose it from the drop-down to update an existing one) and uploading it for you. You can do all this manually, but the toolkit really, really makes this simple. That is sending an IntentRequest with two parameters and you can see the response functioned correctly! Yay! UPDATE: Previously this wasn’t working but thanks to user @jpkbst in the Alexa Slack channel he pointed out my issue. All code above updated to reflect working version. Well I had you reading this far at least. As you can see the port of the Slight.Alexa library doesn’t seem to quite be working with the response object. I can’t pinpoint why the Alexa test console feels the response is valid as the schema looks correct for the response object. Can you spot the issue in the code above? If so, please comment (or better yet, fix it in my sample code).